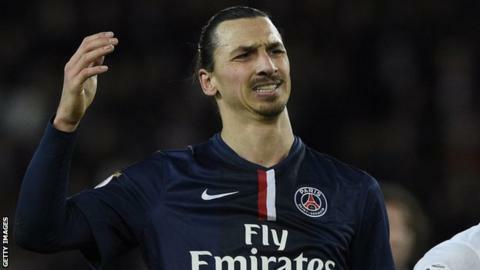 Zlatan Ibrahimovic is upset at losing out to tennis ace Bjorn Borg as Sweden's top sports person of all time. Swedish newspaper Dagens Nyheter ranked the top 150 Swedes but placed Ibrahimovic behind the five-times Wimbledon winner. Congratulated by the paper, the PSG striker responded: "Thank you, but to finish second is like finishing last." Asked for his top Swedes, he replied: "I would have been No 1, 2, 3, 4 and 5, with due respect to the others." However, Ibrahimovic admitted that Borg, who also won six French Open titles, was a "cool person" and "a living legend". Borg dominated Wimbledon for five straight years between 1976 and 1980, before losing to John McEnroe in the 1981 final.